Son and I love Korean food. He is sure to get the hot tofu soup (extra spicy! ), and I never fail to get the bulgogi (BBQ beef). When the waiter comes out with a burning hot plate, the beef is smoking and onions are still sizzling. You can see the sugars in the onions caramelizing, and smell the smoky-sweetness of the beef. The silky sweet onions are the perfect contrast to the flavorful, chewy beef. Since I love bulgogi so much, the natural choice (for me at least) would be to put it in a sushi roll. The rice cuts through the richness of the bulgogi and the onions, and balances it wonderfully. Sure, it takes a bit of time to make, but even without rolling it in sushi, the bulgogi is well worth the time spent. This bulgogi recipe is from My Korean Kitchen. Mix the shoyu, brown sugar, mirin, grated onion, garlic, apple, ginger, and black pepper in a large bowl. Mix in the sliced meat, then the sesame oil. Cover with plastic wrap, and marinate in the fridge for at least 4 hours. Preheat a wok or large skillet over medium high heat. Add the cooking oil. Add the meat and vegetables. Cook, stirring occassionally, for 3 to 5 mins or until the meat starts to brown. When the meat is nearly cooked, mix in the sesame seeds. Roll the sushi, using several pieces of bulgogi and onion as your fillings. Going to your blog, so gets me in the mood for sushi, and food in general. I am a kalbi kind of girl, but I can see bulgogi working better in the sushi… since it’s less chewy. Actually at my favorite gimbap place, they have gimbap with bulgogi in it 🙂 or thinly sliced beef, not sure if it’s exactly bulgogi,I generally get the regular kind! 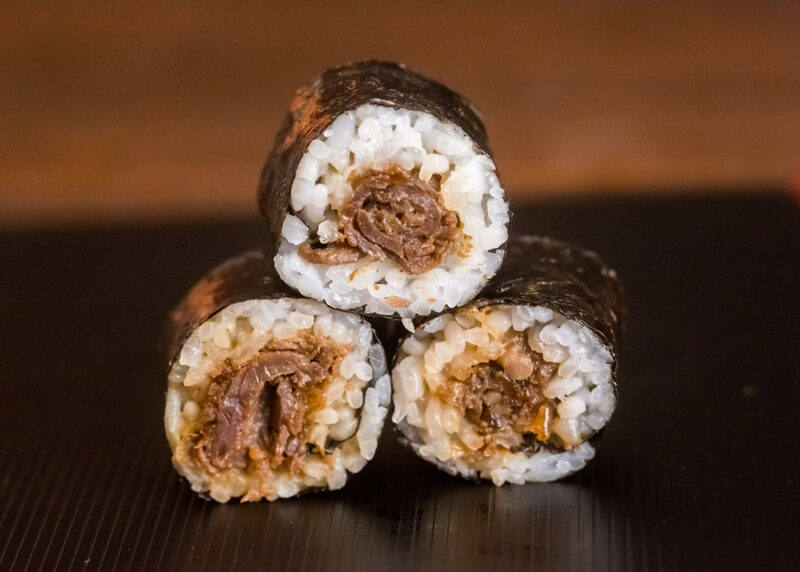 A bulgogi roll sounds like an excellent idea! I almost never order bulgogi at restaurants, but I think this post is going to start a craving for one. Did you try adding asian pear to bulgogi marinade? Korean variety works best and gives most flavor. But you can substitute Bosc or even Anjou pears if asian is not available – not ideal, but as long as it is juicy, it’ll work. No, but that sounds delicious! I’ve never heard of adding pear to the bulgogi marinade, but I’ll bet it makes it even juicier and adds a great sweetness to it – yum!